CALL your order in - 815-609-5831! outdoor activities are starting full "swing"
"spring" on over for our "bloomin" deals - entire shop has discounts! 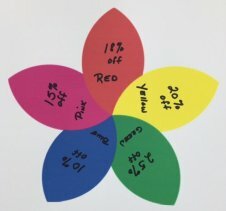 All other non-special listed sale items purchased receive discount at check out - draw a petal and match to discount flower chart - 10% - 25% off!